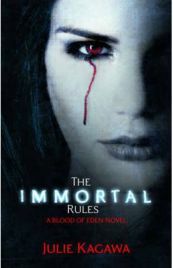 The Immortal Rules is the first novel in a new series by Julie Kagawa. Her Iron Fey series seems to be quite popular, however I wasn’t that blown away by the first novel and have never got round to continuing with the series. The Immortal Rules was available in the recent Kindle sale, and I decided that I may as well give it a go. Set in the not-too-distant future, the world is now ruled by vampires. Following a plague which wiped out a lot of the human population, the vampires took control in order to safeguard their food supply from extinction. Outside their heavily guarded cities are rabids, zombie-like creatures who feed on humans.